Forget about the pain! This amazing waist cincher will relieve the annoying backache with no bulky pads. It is designed with side and back boning for lumbar support while highlighting your curves. And what is best, it's functional yet discreet, you can wear it all day and every day! With its comfy SkinFuse® material you will hardly notice you have it on. It will disappear under your clothing. Feel great and look amazing with the magic of this girdle. Side and back boning for lumbar support that bend easily but recover their original shape. They will relieve your backache in no time while smoothing curves and training your waist. Special design to avoid fabric from riding up when you sit or bend. 3 anatomically - sized highly elastic control bands for a perfect fit and adjustable compression distribution. The spaces between bands allow you to reduce body heat and stay dry. 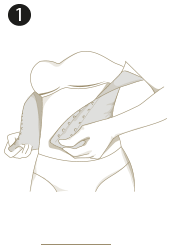 Control bands also allow you to adjust the girdle on each section of your torso, according to your body needs (see image). 3 position hook & eye closure to adjust size as necessary with inner lining to protect your skin. Fiber and threads that allow air to pass through to dry quickly and maintain your freshness. Machine washable and guaranteed no-fade. Tired of bulky rigid pads? Our cincher is comfortable enough for everyday use. Love it if you would like back support while holding your baby. Wear it if you want to relieve lumbar pain. Comfortable to wear during aerobic exercise, running, yoga or workout. 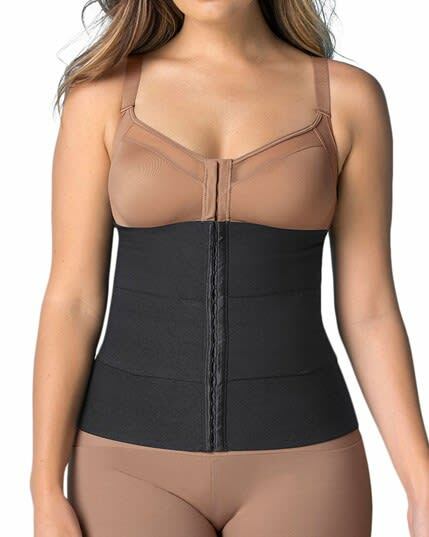 Can also be used as a post-surgical or postpartum waist cincher. 1. Take the garment from the sides and place it on your back. 2. To close it, start securing the hooks from the bottom up. Use a mirror to make sure that the cincher is not rolling up in the back.